This is a an easy, quick craft to do if you want to add a little color to a room. Decoupaging a lightswitch cover only requires a few tools and some time, but the end result can be pretty cute. The other advantage to this craft is because it's so cheap to do, you can make several of them and "switch" them when you want a change. Layout the differnt cutouts onto the cover and see what works for you. This can be the longest part of the project because it takes time to find just the perfect things to put on your cover. For my cover, I wanted to do a little vignette utilizing a small cutout I got from a children's greeting card and added some other small pieces with similar colors. 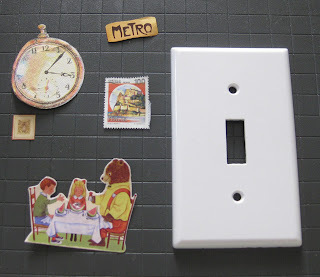 Once you've got your layout, glue the pieces directly onto the cover. Make sure you press/rub out any air bubbles that might form. Smaller cutouts work better because they're easier to glue down. A nice effect is to wrap the cutout around the edge of the cover, like I did with the watch cutout shown in the picture. I like to water down the glue just a little bit, so you get a medium "soupy" consistency. You don't want the glue too thick because it's hard to get an even coverage, but you don't want it too thin because the glue will "bead" up. Keep adding glue/water until you get a consistency that gives you a nice even and smooth coverage. Once the cutouts are glued down, then you need to cover the entire front side of the cover with glue. Brush on the glue in straight strokes, make sure you go in one direction to get an even look. Be careful of air bubbles. Just lightly brush over the air bubbles if they form. Don't glue the backside of the cover. 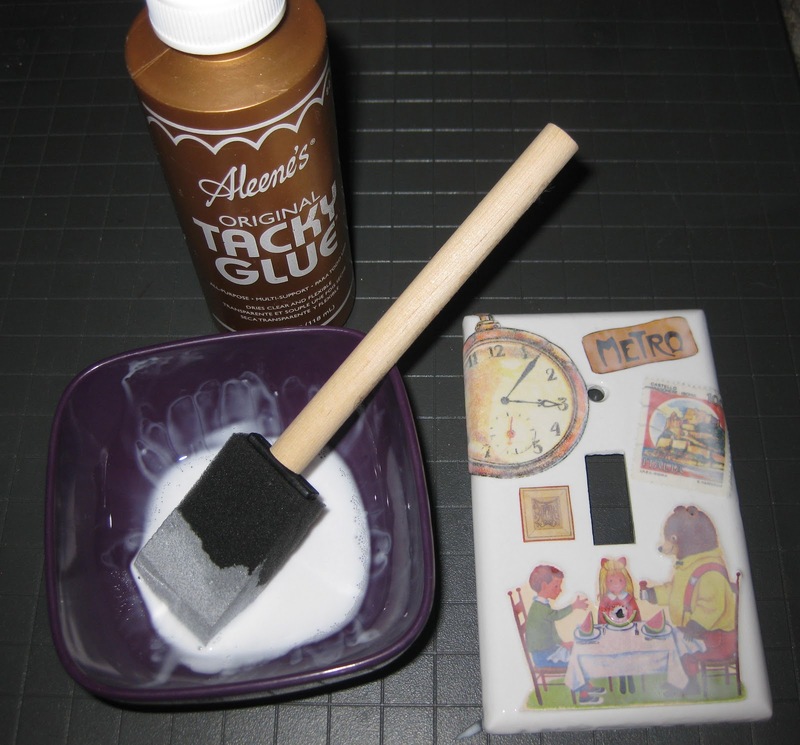 Wait for the first coat to dry, then add a coat of glue again and repeat. I like to add 3 coats of glue, however if you want a thicker covering, add a couple more layers of glue. If you get too many streaks, you can add another coat of glue or you can lightly sand it down. Once the cover is dry, just screw it to the wall and you're done! 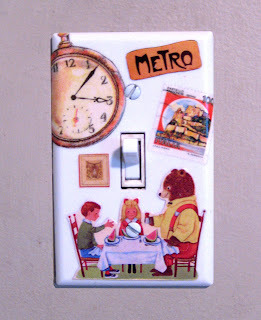 I love the idea of switching out light plates seasonally or as the whim strikes!